Gameloft issued a press release that 10 of its best games have been optimized for show on Google's value-for-money Nexus 7 tablet. The slate sports a 7" display with very good pixel density, and is powered by a quad-core Tegra 3 processor, presupposing an immersive gameplay. The titles sound like the roster of Gameloft's top games, and cover the gamut from car racing, through timewasters, to first-person shooters: Asphalt 7: Heat, Dungeon Hunter III, Fantasy Town, Fashion Icon, Men in Black 3, Modern Combat 3: Fallen Nation, N.O.V.A. 3 : Near Orbit Vanguard Alliance, Oregon Trail: American Settler, Shark Dash, The Amazing Spider-Man. As Gameloft seeks to be one of the first publishers s to optimize its titles for each new platform, it is with great enthusiasm that we now bring a roster of our biggest hits for the new Nexus 7. With the new device features, we will not only be present on one of the best digital platforms out there, but we will be able to truly showcase our unique development approach and ingenuity through the high-quality of our games as well. SAN FRANCISCO, June 27, 2012 /PRNewswire via COMTEX/ -- Coming out of Google I/O 2012, Gameloft, a leading global publisher of digital and social games, has unveiled a lineup of 10 of their most popular titles that have been enhanced for the new Google Nexus 7 tablet, with 8 available today. Google I/O attendees will also find our popular first-person shooter N.O.V.A. 3 : Near Orbit Vanguard Alliance being showcased at the Developer Sandbox tomorrow, with additional titles such as Asphalt 7: Heat and The Amazing Spider-Man releasing soon. Google I/O is focused on the tech world's latest web, mobile and social breakthroughs and bringing together thousands of developers who are turning them into tomorrow's startups. Google I/O returns to San Francisco's Moscone Center from June 27-29, 2012. The Developer Sandbox, first introduced at I/O 2009, is also a designated demo area where a wide range of developers who have built applications based on technologies and products that have been announced at I/O are featured. "As Gameloft seeks to be one of the first publishers s to optimize its titles for each new platform, it is with great enthusiasm that we now bring a roster of our biggest hits for the new Nexus 7," said Baudouin Corman, Vice President of Publishing for the Americas. "With the new device features, we will not only be present on one of the best digital platforms out there, but we will be able to truly showcase our unique development approach and ingenuity through the high-quality of our games as well." Modern Combat, and N.O.V.A. : Near Orbit Vanguard Alliance®, and also partners with major rights holders including Marvel®, Hasbro®, FOX®, Mattel® and Ferrari®. Gameloft is present on all continents, distributes its games in over 100 countries and employs over 5,000 developers. Gameloft is listed on the Paris Stock Exchange (isin:FR0000079600)(bloomberg:GFT FP)(reuters:GLFT.PA). Gameloft's sponsored Level 1 ADR (ticker:GLOFY) is traded OTC in the US. "In other news, Gameloft, after reading Michael's article on game compatibility with the N7 and JB decided they did not want to be caught in his cross-hairs like EA and went ahead and updated their catalog." 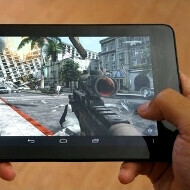 About time they optimised some games for android tablets :S We were in agony for ages...which god I need to thank? They need to add N7 support for some of their older games like Backstab, 9MM, Tintin, ect.